The first five album titles this week on the Top Country Albums Chart read like a line in a good country song; After lighting a Fuse, she Crash My Party now it Feels Like Home so Here’s To The Good Times, Based On A True Story. 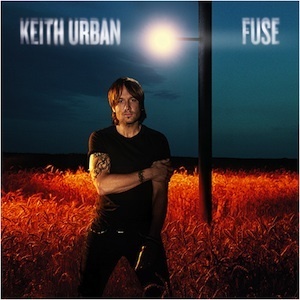 Keith Urban’s Fuse from Capitol Records Nashville debuted strongly this week on the top of the Country chart (and No. 1 overall) with 98k albums sold. The No. 2 position went to Luke Bryan’s Crash My Party selling another 53k, his 4th week (900k RTD), followed by Warner Bros. Sheryl Crow‘s debut Country album, Feels Like Home, at No. 3 (No. 7 overall) selling 36k in its first week. Florida Georgia Line’s Here’s To The Good Times sold another 19k units (1.1M RTD) while Blake Shelton‘s Based On A True Story sold 11k (887 RRD). Also debuting this week is George Jones’ Amazing Grace selling 2k. Love it or hate it, Miley Cyrus‘ newest single “Wrecking Ball” sells 477k units this week (883k RTD). Let’s move on. The top Country track this week (No. 11 overall) is Bryan’s “That’s My Kind Of Night” selling 99k (607k RTD). Urban and Miranda Lambert‘s duet single, “We Were Us,” sells 32k in its first week out, sitting at No. 8 (No. 40 overall). Next week releases will include Billy Currington‘s We Are Tonight, who is featured on the current issue of MusicRow Magazine, Chris Young‘s A.M., and Justin Moore‘s Off The Beaten Path.